As the 2018 Fellowship approaches we want to take a moment to spotlight some of our Former Fellows! It has been the ultimate #TBT reflecting on the amazing work they accomplished and the relationships they built during their time at the Bus. We are inspired by the impact former fellows continue to make as active and vibrant members of the community. Our Fellowship Alumni will always hold a special place in our hearts and are an invaluable part of our Bus family. Sera, who grew up in central California, moved to Seattle in 2005. Sera got word of the Bus while she was in graduate school for social work at the University of Washington when the Bus made a special visit to her Youth Empowerment class. 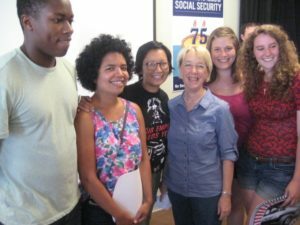 Sera’s favorite memory of her time at the fellowship is when the Fellows raced to the Greenwood Senior Center for the Social Security Birthday Party, to meet Senator Patty Murray. During the event, Sera was bestowed a “The only Rossi I trust is Carlo” t-shirt, which she loved and promptly hid. After the fellowship and graduate school, Sera went on to be a community and labor organizer at Working Washington and SEIU 775. She then ran Pramila Jayapal’s state senate race in 2014 and worked for Councilmember Tim Burgess as a legislative assistant for three years before joining him as a policy advisor in the Mayor’s Office for 71 days. In January 2018 Sera co-founded Charles – Day Strategic, a political consulting firm centering candidates and communities of color. 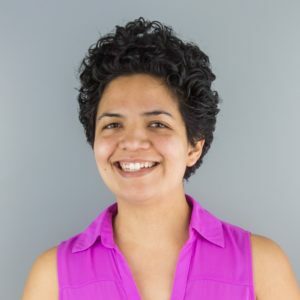 In April she will return to the City of Seattle’s Information Technology department as the Community Technology Outreach Coordinator, engaging community and tech partners to increase digital access and equity across the city. Sera is also a proud board member of the Bus, and we are incredibly grateful for all the work she has done for our organization in enhancing the voices of young people in our communities.